Like the West Side Highway in Manhattan, the peer review process in climate science had drowned by the year 2008. A new article in Nature claims that sea level is rising much faster in the Northeastern US than on the rest of the planet. 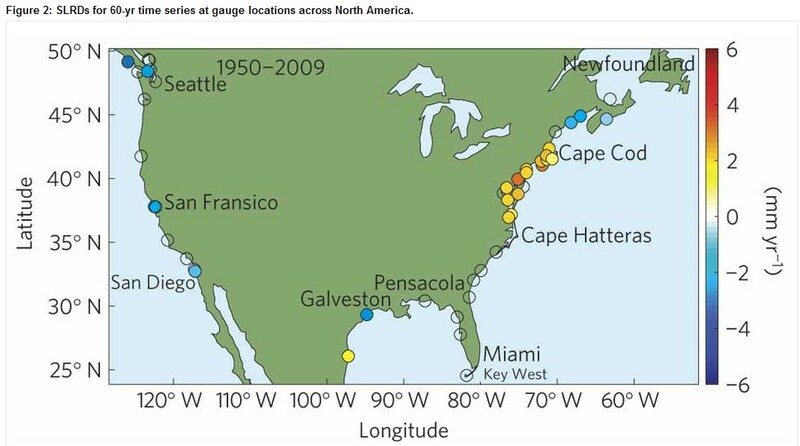 WASHINGTON — From Cape Hatteras, N.C., to just north of Boston, sea levels are rising much faster than around the globe, putting one of the world’s most costly coasts in danger of flooding, government researchers report. U.S. Geological Survey scientists call the 600-mile swath a “hot spot” for climbing sea levels caused by global warming. Along the region, the Atlantic Ocean has risen at an annual rate three to four times faster than the global average since 1990, according to the study published Sunday in the journal Nature Climate Change. Had anyone with half a brain peer-reviewed this paper, they would have looked at the satellite data and realized that there has been little or no sea level rise in that region over the last decade. Much of the rise in sea level which the authors think they are seeing, is actually due to subsidence of the land. It is a well know fact that global warming is a hoax! It is hard to believe that these AGW advocates can keep parroting this garbage when the evidence is so overwhelmingly against them. I guess they just don’t know how foolish they look to be punked by lies. Hahahaha I just have to laugh that they don’t have brains enough to examine all the evidence but just jump at the first thing that seems to agree with the position they want to take. Global warming hahahaha , it looks like we might have to worry about global cooling. Now that is scary. But I don’t think that will be all that bad either as man , and every thing else , is pretty adaptable. Some guy, I forget who, my apologies, wrote a book titled Don’t sell your coat. Over at Climate Etc. there is a concern that errors were made in a paper that the IPCC relied heavily on to support its supposition that climate sensitivity for a doubling of CO2 is 3 degC. It appears that the scientist in question, Forest, is unable/unwilling to provide the original data used in his study, to a scientist (the one that found errors in Steig’s Antarctic paper) that would like to verify Forest’s findings. The IPCC has been found to be lax in its past reports by inserting large amounts of grey literature provided by eco-activist groups and palming it off as peer reviewed. But rather than tighten up the process the IPCC will now fully embraced post-modern climate science and drop the pretense that their work is all peer reviewed by using and treating grey literature as peer reviewed in AR5. We have reached the point where evidence based science doesn’t matter anymore in climate science as enough activist scientists supported by powerful, monied political/financial interests and most media, are convinced that they have attained demigod status and are omnipotent in their modeling and no longer have to answer to anyone when their work is found to be flawed. @Sundance: I went over to Climate Etc and had a read of the post. If this indeed true (that is, a climate sensitivity of only 1C), that means feedbacks are negative, as a doubling of CO2 will produce about 1.2C of warming without any feedbacks. The AGW house of cards continues to crumble. Maybe I’m missing something here, but isn’t sea level supposed to be…..level? How can one shore of the Atlantic be higher than the other? And how can they print an article on this topic without addressing that issue? I guess as long as there is a “consensus,” people will believe anything. I should have said, “How can sea level at one shore of the Atlantic be higher than at another shore? It’s apparent sea level. If the land is sinking it looks as though the sea level has gone up. Just to note; the sea level isn’t level all over the world, as the height of the water varies significantly (sometimes higher, sometimes lower) from the idealized ellipsoid that it would be at according to the curvature of the Earth. This is due to the irregularity of the gravitational strength of the Earth, which is due to the variation in density throughout the Earth. Peer review is a joke. If you are on the AGW gravy train where everyone jumps like a trained seal and says “its worse than we thought”, no one bothers to check the data. Peer review means your friends think you are as smart as you think you are. I touched on this a bit yesterday at my blog, but, consider that the historical data for most of these places shows those values going up at the same pace for well over a hundred years. Consider Battery Park. They have data going back to the late 1850′s, which shows a consistent 2.77mm a year. That’s about .91 inches per century. Which is consistent with the expected sea level rise during a warm period. Yet, what does this say about the AGW theory? If global warming is causing sea rise, should we not see consistent sea rise around the world? Why do we much higher values in some places, like Virginia (4-6mm a year), than in places like NYC and Georgia? Why, just a little bit down the coast in NC, do we see values in the 2-3mm range? Oh, and for reference, your hair can grow anywhere from 6-10 centimeters a year. That’s 60-100 millimeters. Perspective. northeastern U.S. has experienced subsistence for millions of years continuing up through today. Plate tectonics is the culprit; it has nothing to do with man or with climate. Obama’s plan is to have all of America on subsistence, but that has little to do with geology. Take a large bowl……fill it to “X” with water…..cap it off with ice….note present water level….allow ice to melt….measure the level of water now….how much did it rise as the ice floating within melted…(snicker). I’m aware that there are land bound “icebergs” commonly known as glaciers…anyone aware of the % to the floating type? If GW isn’t a hoax, (which I doubt), would that % give one a more accurate estimate in rise, if any, to our oceans? Yes, a continental shelf could be subsiding, which is the likely. But to claim all land masses are sinking would not explain why icebergs and the polar ice caps are reducing in size. Icebergs and ice caps float, so there goes the original theory of land sinking. “How much does the New York Metropolitan Area weigh?” Place a cup of coffee on top of your car and you have a fair visual representation based on how far down the car settles. http://www.newyorknature.net/Geology.html And by any chance is this your congressional representative you seem to be on the same wave length? Your analogy is misleading. If you covered Manhattan with one metre of concrete, the island would eventually sink by about 70 cm. It is a simple ratio of the density of the concrete to the density of the mantle. If the concrete & asphalt & steel (& glass & plastics) were all made from ores & deposits found in & on Manhattan . . .
NASA Climate Scientist, James Hansen, says Global Warming is Not Man-Made — In a paper published in PNAS in 2000, Hansen argues that “rapid warming in recent decades has been driven mainly by non-CO2 greenhouse gases… not by the products of fossil fuel burning, CO2 and aerosols…” Furthermore, Hansen correctly points out “The growth rate of non-CO2 greenhouse gases has declined in the past decade.” The summary of the paper states, “Non-CO2 Greenhouse Gases: These gases are probably the main cause of observed global warming, with CH4 [methane] causing the largest net climate forcing.” — Hansen’s use of the word “probably” is an admission that he’s unsure about methane, as he should be since methane represents an extremely tiny 0.0000017 mole fraction of the atmosphere and contributes almost nothing to the posited ‘greenhouse’ effect. Court orders University of Virginia to release documents and raw data pertaining to the discredited global-warming myth. These documents are believed to contain damning evidence of deliberate distortion and falsification of scientific data to support the theory of catastrophic, man-made global warming. The University has done everything possible to keep these files hidden from the public, but the court says the taxpayers’ have a right to know how their money was used.